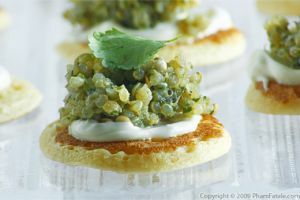 We're having a large dinner party this Saturday, so I tested a new appetizer recipe today. 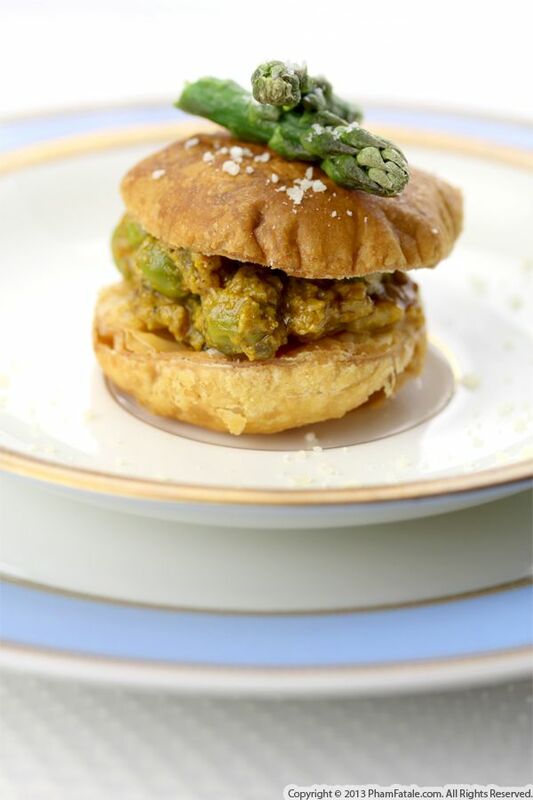 I prepared the filling for the appetizers with green peas and asparagus. 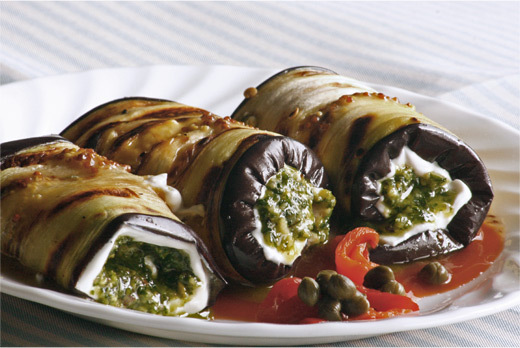 To ensure that the filling would spread easily, I also added eggplant pulp and a bit of Pecorino cheese. To save time, instead of placing puff pastry dough into molds and following the curve of the molds, I cut pastry rounds. Once baked and flaky, I divided them in half crosswise, then filled them with the green mixture. 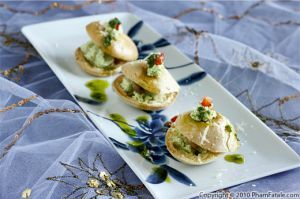 They resembled savory pâte à choux buns, minus all the labor normally required. Dice the eggplant into large chunks, leaving the skin on. In a large pot, bring about 4 quarts of water to a full boil. Add the eggplant. Cook for about 30-40 minutes until soft and tender. Drain the eggplant using a fine mesh colander. Discard the liquid. 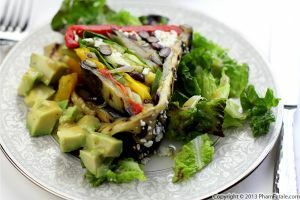 In a large colander, place the eggplant pulp in a double-layered cheese cloth. Wrap it and make a knot at the tip and suspend it over the colander using chopsticks. The colander is not essential but is quite convenient; if the knot breaks, you can gather the eggplant again in the cheese cloth without starting over. Let it sit for about an hour. Drain as much liquid as possible. Reserve about 1 tablespoon of raw shallots; cook the rest. In a nonstick pan, heat the olive oil. Add the chopped shallots. Cook about 6-8 minutes, until the shallots are soft and slightly golden. Add garlic. Cook until it's fragrant. Add the asparagus spears and cook for 2-3 minutes. Transfer as many as possible to a plate and add the rest of the chopped asparagus to the pan with the eggplant, ground coriander, paprika and turmeric powder. Stir for about 5 minutes. Add the green bell pepper and mint and flat-leaf parsley. Stir constantly so that the mixture does not stick to the bottom the pan. Season with salt. Mash the eggplant using a potato masher or a fork until all the eggplant pulp is puréed. Add the green peas, cover and let sit until ready to assemble. Place a silicon mat or a sheet of parchment paper on a baking tray. Place the dough rounds on the baking tray. Bake for 5 minutes at 375°F; lower the temperature to 350°F and bake for another 13-15 minutes. The texture of the puff pastry should be very flaky. Let them cool completely. Using a fork, separate the flaky layers in half, crosswise. Add yogurt and 3 tablespoons Pecorino cheese to the cooled eggplant/asparagus/pea mixture. Drizzle with lemon juice. Adjust seasoning. Mix well. Place the bottom slice of the puff pastry, outer crust side down. 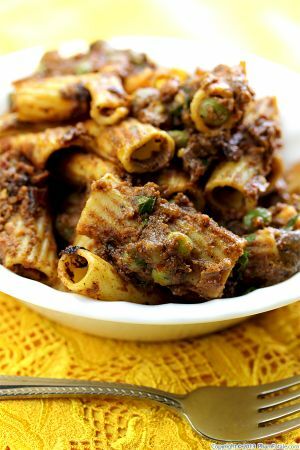 Using 2 teaspoons, gather one portion of the eggplant/asparagus/pea filling in one spoon. Scrape the loose mixture from the sides using the other spoon and fill in the cavity of each puff pastry.. Close with the top piece of puff pastry. Top with the reserved asparagus spears as a reminder of the flavor of the appetizer. Sprinkle with the remaining Pecorino cheese. Repeat until all the ingredients are used. I usually use store-bought puff pastry dough from a local Middle Eastern market. Often, I have found that the puff pastry dough sold at local chain stores is made with hydrogenated oils or lard instead of butter. At Middle Eastern markets, it's always made with butter. I used a circle cutter to form the dough rounds. Published By: Jacqueline Pham on October 17, 2013.